Information on the final exam is on the left menu. The grades menu on the left has all the information about your current grades. By class time on Friday I will have the final numerical grade for you prior to the exam, the grade that accounts for all possible attendance points. There will be no attendance taken Friday. Remember you can turn in attendance assignments in the box in AGH 419. Today we will be discussing how to invest retirement savings, paying special attention to how to choose stocks and what type of rate–of–return to expect. Today I will hand back Exam 3 and post the answer key so that you may check it. This answer key is also at the grades tab of this website, along with other information about your grades. A clarification: If you do not plan to take the final exam, you still must have perfect attendance between exam 3 and the final. This does not mean that you have to be at every class. It means that if you do miss a class you must do a Planet Money assignment to make up for it, as described in the syllabus. Remember, there is no distinctin between an excused and unexcused absence in this class. Today I will hand back paper grades. Most of you will have few comments on them and many comments will not mean anything to you. With so many papers to grade I cannot provide much feedback, and I would never assign a paper in this class if it were up to me. Know that because of this I was very leniant in grading. Tell me if the score on the website differs from the score on your hard copy, but please dont ask me why you got a certain grade, as I may have graded your paper months ago and remember that I grade papers mostly by listening to them while walking. Preliminary scores for Exam 3 are posted. They are probably correct but have not been double–checked. I cannot give them back yet because not everyone has taken the exam. Exam 3 scores have a 5 percentage point curve added to it. If you wish to keep this points, do the following. Call your parents (or one of them, or some adult) and ask them how they are saving and investing money for retirement. Write a brief summary of their strategy and bring it to class on Friday, with your name on it. This may be one of the most important conversations you have in your life, so listen to them carefully. Today we will continue to take notes on Chapter 6, Supply and Demand, continuing with this worksheet and then using this worksheet. Exam 3 is April 24. You will need orange scantrons. A study guide will be availableon Friday. Today we will take notes on Chapter 6, Supply and Demand, using this worksheet. Exam 3 is April 24. Today we will finish discussing supply and demand and talk about the test. Please disregard the worksheet I distributed on 4/17 but did not discuss. Exam 3 is April 24. Information is at the Exam 3 tab to the left.. Here is Homework 13. It is due at the beginning of class on Friday. If you cant be at class to turn it in email it to TA Luke before the beginning of class. Lets plan to work hard today and Wednesday so we can cancel class on Good Friday. Homework 12 (in D2L or Online Classroom) is due by midnight on April 10. Today we will hand back the tests, go over it, and maybe take some notes. The exam is out of 50 points, and I automatically granted two points to every student, so your actual grade is 100*(50 + 2 - the number of points off on the front of your exam)/50. The exams were very bad. It seems like many did not study. The number of students receiving an A (90 or better) is the same as Exam 1, but most others did worse than Exam 1. There are a number of spectacularly low grades, and when I look at their work on the exam they just obviously did not study. 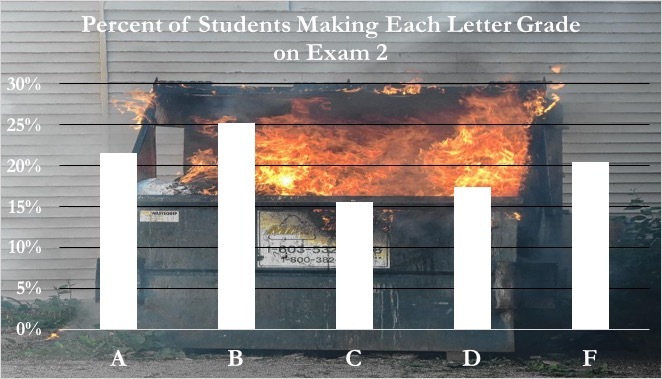 May I also add that most students used very little of their cheat sheets. Note that the syllabus shows you how to calculate your current grade for the class, but you have to make a number of assumptions, like your paper grade. For most of you, though, your paper grade is higher than your Exam 2 grade. Today we will continue taking notes regarding Chapter 5.a, concentrating on sections viii and ix. Tests are very, very close to being graded. Homework 11 (in D2L or Online Classroom) is due by midnight on April 3. Today we will continue taking notes regarding Chapter 5.a, concentrating on section vii. We will complete this worksheet handed out in last class. We will add some notes to that worksheet. Today we will continue taking notes regarding Chapter 5.a, concentrating on section vii. Caleb and Dr. Norwood will begin class on Wednesday by singing the balcony scene from West Side Story (Norwood gets to be the dude). Today we will take notes, practicing material we have covered for exam 2. See the new page I created showing details for Exam 2 (menu on left). Chelsea Stanfield will begin today and will bring a quote about having a positive attitude. Exam 2 is Friday. Specific details will be available on Wednesday. You will not need a scantron, you must use a simple calculator provided to you, and the questions come straight from our practice questions and homework. Chelsea Stanfield will begin class on March 22 and will bring a quote about having a positive attitude. Today we complete worksheets concerning Chapter 4.d. No class on Friday, but I think something very important is due Friday. A hard copy of Homework 9 WAS due at the beginning of class on March 6. You can turn it in by March 8 for a 10 percentage point deduction. This homework counts twice as much as the normal homework, so it is really Homeowork 9 and Homework 10. TA Luke Chapman will begin class on March 8 and will discuss how we went about getting a good internship. There is no class March 10, but remember that is when your papers are due! A hard copy of Homework 9 is due at the beginning of class on March 6. You can turn it in by March 8 for a 10 percentage point deduction. This homework counts twice as much as the normal homework, so it is really Homeowork 9 and Homework 10. Carly Olufs will begin class on March 6 and will bring a quote on the topic of gossip. Warning: I have a cold, so you might want to keep your distance from me. Today we will finish Chapter 4.c and discuss Homework 9 in the process. We will be doing calculations together, so get out your calculator or smartphone. Homework 8 WAS due by the beginning of class on Feb 27. Students turning it in after Feb 27 but before March 3 late will receive a 10 percentage point reduction. Although there is no class on Friday, TAs Luke and Dalacy will come to class to help you with your homework if you want help. No attendance will be taken. Wednesday, March 1 Mary Kurzweil will begin class and will answer the question: How do I turn in my class paper?. There will be no class on Friday, March 3. All exam 1 grades should be posted now. Tell me asap is yours is not. We will now begin inspecting signatures on the attendance sheet to detect the 1-3 other persons who signed in for other people. Today we will work on the section of the Chapter 4 worksheets titled 4.c—Marginal Product. We will be doing some calculations so get your phone/calculator ready. Homework 8 is due by the beginning of class on Feb 27. Students turning it in after Feb 27 but before March 3 late will receive a 10 percentage point reduction. On Monday, Feb 27 Christine Caine will begin class and will bring a quote about developing good relations with other people. Today we will discuss the class paper. Your exam 1 grades are posted at the grades part of the class website. Students who did not take the exam at the regular time will not see their grades till Monday at the earliest. You will receive your scantrons at a later date to check everything. Thank you to the one person who confessed to signing someone else in on the attendance sheet. I am looking for 1-3 more people willing to follow their conscience. On Friday, Feb 24 Audrey Lucas will begin class and will bring a quote about developing good relations with other people. Today we will cover Chapter 4.b. Throughout Chapter 4 we are using the worksheets handed out in class, which are also available as the Practice Questions in Chapter 4. I should have exam grades posted by Friday for all those who took the exam at the normal time. Because there were four less people in class than actual signatures on the attendance form on 2/20 (we count heads almost every class) no one will receive attendance points for 2/20 until those who signed for other people personally confess and receive my forgiveness. For Friday, watch the movie Trading Places (you can rent it at Amazon Video) and read the paper directions carefully. Friday I will answer questions about the paper but there will not be a prepared lecture on the paper. That will be the only class where I entertain questions about the movie. On Wednesday, Feb 22 William Starr will begin class and will bring a quote about developing good relations with other people. At the end of class my daughters will come to sell Girl Scout cookies. They accept credit cards. On Wednesday, Jan 22 William Starr will begin class and will bring a quote about developing good relations with other people. On Friday, Jan 24 Audrey Lucas will begin class and will bring a quote about developing good relations with other people. Today we will work on the practice questions to review for Fridays test. If you need special accommodations for Fridays exam please see me after the exam. Note the location of the TA review session has been changed from AGH 320 to AGH 101. There will be no assignments until after the exam. Student Madeline Merrit will begin class on Wednesday 2/15. After leading the chant, they should share their experiences trading on the OU Feb 18 contract. Student Jastin Metten will begin class on Monday 2/13. After leading the chant, they should share their experiences trading on the OU Feb 18 contract. Today you can ask for help on Homework 7 and we will discuss questions on worksheets about trade that havent been addressed yet. There is a new tab on the left with information and more practice questions regarding Exam 1 to be given on February 17. Remember you will need orange scantrons. A HARD COPY OF HOMEWORK 7 IS DUE AT THE BEGINNING OF CLASS ON FEB 13. NO LATE SUBMISSIONS WILL BE ACCEPTED. Student Emily Cooper will begin class on Friday 2/10. After leading the chant, they should share their experiences trading on the OU Feb 18 contract. Today we will continue taking notes on the worksheets from last time. Homework 6 is due by midnight on Feb 8. It must be submitted at the Online Classroom but a hard copy is available here . Student Abigail Gooden will begin class on Wednesday 2/8. After leading the chant, they should share their experiences trading on the OU Feb 18 contract. Student Madeline Merrit will begin class on Monday 2/15. After leading the chant, they should share their experiences trading on the OU Feb 18 contract. Today we will take notes on the worksheets here and here regarding trade issues. Student Caleb Wilson will begin class today. After leading the chant, they should answer the question: When is Exam 1? Today we will continue working the Chapter 3 worksheets, from the last two classes. The answer key to Homework 5 is here . For your class paper you must describe how the main plot of Trading Places could have taken place in our b–ball futures market. To give you an idea of what Im talking about, in the paper instructions I included an excerpt from the movie to show you the main scene Im talking about. Student Brooklyn West will begin class today. After leading the chant, they should answer the question: Do I need to bring a scantron for Exam 1? Student Caleb Wilson will begin class on Monday 2/6. 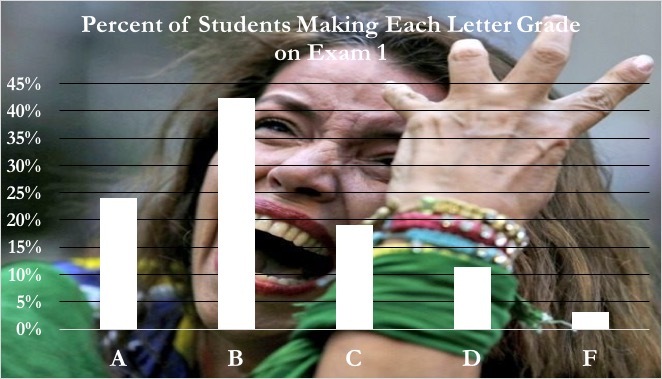 After leading the chant, they should answer the question: When is Exam 1? 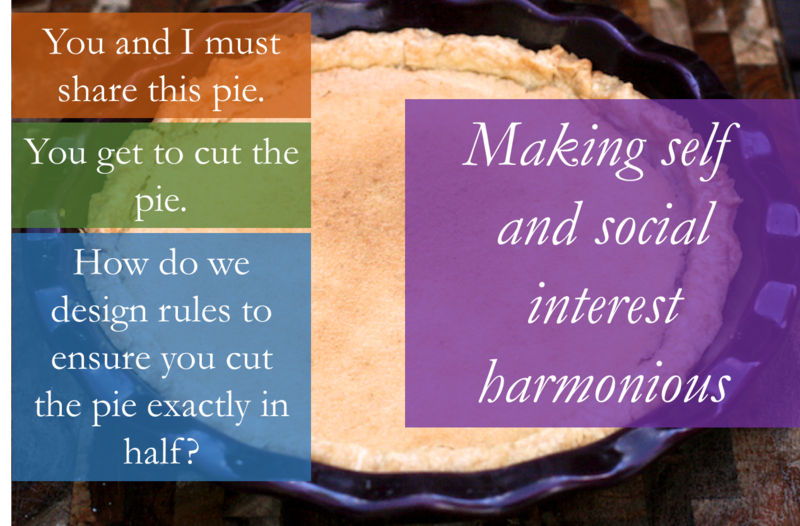 Today we will begin working on Chapter 3 worksheets, including this addendum. All the material for Mondays and todays lecture is in Chapter 3 of the online textbook (see left). 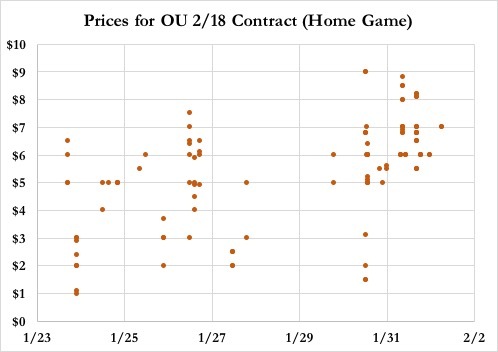 You should now be trading the OU Feb 18 contract (which is a home game), and keeping notes on your strategy and its outcomes, and how you alter your strategy. Homework 4 answers are here . Homework 5 on the second part of Chapter 2 is due by midnight on 2/1. Although you must submit the homework using the Online Classroom, a hard copy of it is here . Student Kristy Johnson will begin class today. After leading the chant, they should answer the question: Can we use cheat sheets on exams? Student Brooklyn West will begin class on Friday 2/3. After leading the chant, they should answer the question: Do I need to bring a scantron for Exam 1? FYI, Im thinking of playing the movie Trading Places during class sometime. I will now allow you to drop two homeworks. 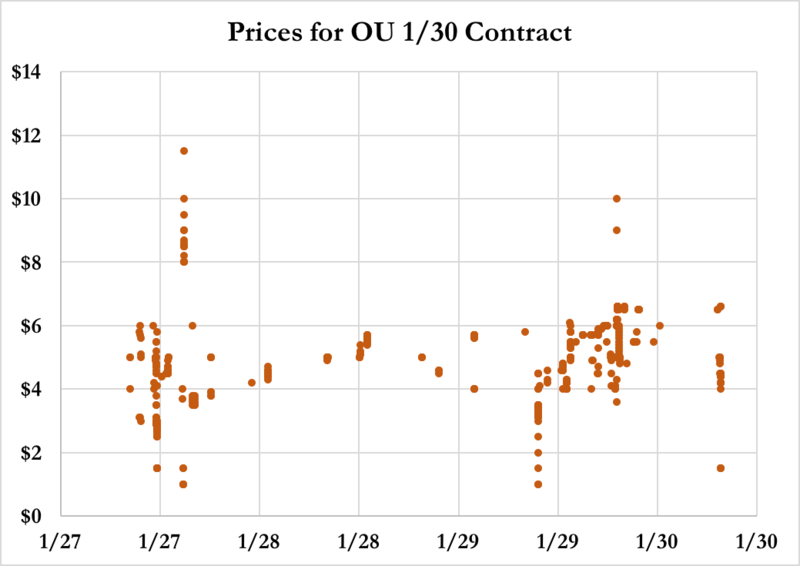 Tonight the OU 1/30 contract expires! Below are the prices of this contract in the last few days. Homework 3 answers are here. Homework 4 on the first part of Chapter 2 is due by midnight on 1/30. Although you must submit the homework using the Online Classroom, a hard copy of it is here . Student Caroline Girard will begin class on Monday 1/30. After leading the chant, they should answer the question: Where are the instructions for the class paper? Student Kristy Johnson will begin class on Wednesday 2/1. After leading the chant, they should answer the question: Can we use cheat sheets on exams? Today we will take notes on this handout and this video that links recent food shortages in Venezuela to the material in Chapter 2. An answer key for Homework 2 is here. Homework 3 is due by midnight on 1/27. See 1/18 announcements. You should be studying Chapter 1 (see tab at left). Student Bailey Kerns will begin class on Friday 1/27. After leading the chant, they should answer the question: When is the class paper due? Student Caroline Girard will begin class on Friday 1/30. After leading the chant, they should answer the question: Where are the instructions for the class paper? Student Kristy Johnson will begin class on Friday 2/1. After leading the chant, they should answer the question: Can we use cheat sheets on exams? Today we will take notes regarding this handout on the Tragedy of the Commons. Our discussion will include this pic, this pic, this pic,and this video, in addition to some Video 2 of Chapter 1. Observe that I am posting flashcards on Quizlet (see left menu) to help you study for tests. After the deadline for a homework is passed Ill post answer keys. A number of you did not complete Homework 1. Homework 2 is due by midnight on 1/25. See 1/18 announcements. You should be studying the Guide tab at the futures market webpage. Homework 4 on part of Chapter 2 is due by midnight on 1/30. Although you must submit the homework using the Online Classroom, a hard copy of it is here . Student Caleb Wood will begin class on Wednesday 1/25. After leading the chant, they should answer the question: When are the office hours for TA Luke and Dalacy? Where are office hours held?. 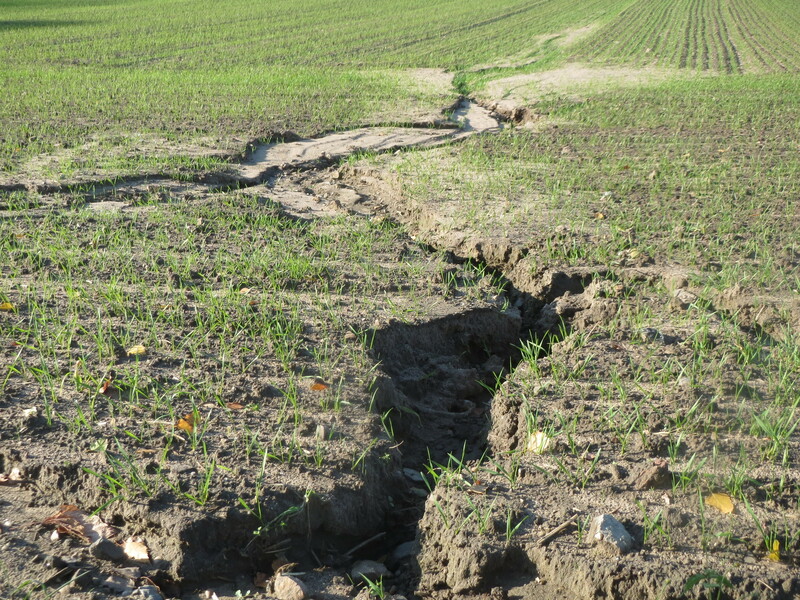 Today we will take notes regarding this handout on wheat futures markets and this handout the Tragedy of the Commons. 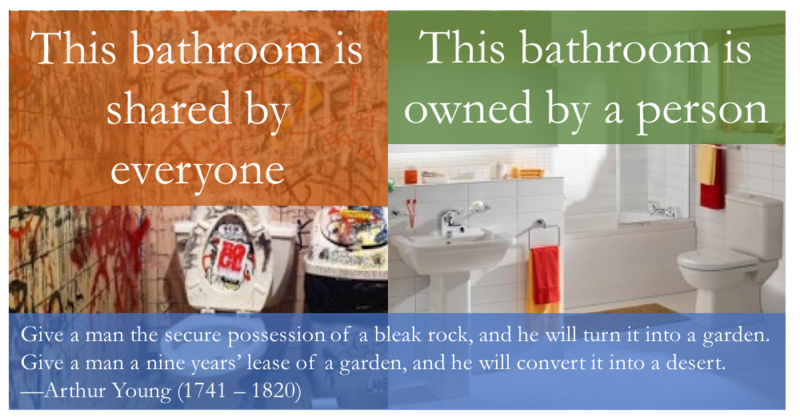 Our discussion of Tragedy of the Commons is an extension of Chapter 1, which you should be reading to complete Homework 3. 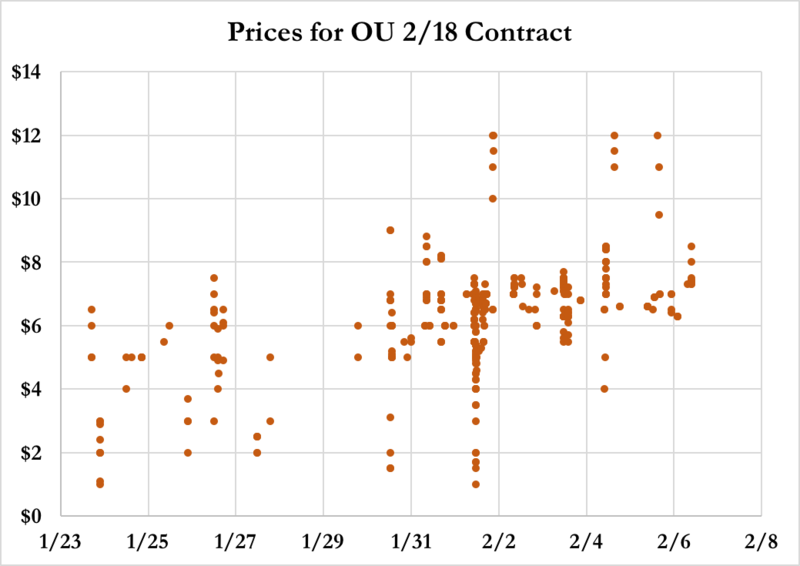 You may begin trading today on both the OU 1/30 and the OU 2/18 contract in our futures market. For the Texas Tech 1/21 the website did not work perfectly but it did work well. We had over 600 trades. You can see the results of your trades by choosing the Texas Tech 1/21 contract and going to the Records tab. Today I want girls sitting on the left (your left) side of the classroom and the boys sitting on the right (your right) side of the classroom. Practice trading in the class futures market. If you miss class you need to get the notes from a fellow student. Several have asked ... there is nothing you need to be buy for the class, including no textbook. The textbook is provided for free online at the class website. You need to try and make 3 trades on the Texas Tech 1/21 contract by the end of the game. It starts at 1 PM tomorrow. No trades made after the end of the game count, even if the website is still functional then. Homework 1 is due by noon on 1/23. See 1/18 announcements. Homework 3 is due by midnight on 1/27. See 1/18 announcements. Student Ramee Aranda will begin class on today. Student Emily Bechtold will begin class on Monday. 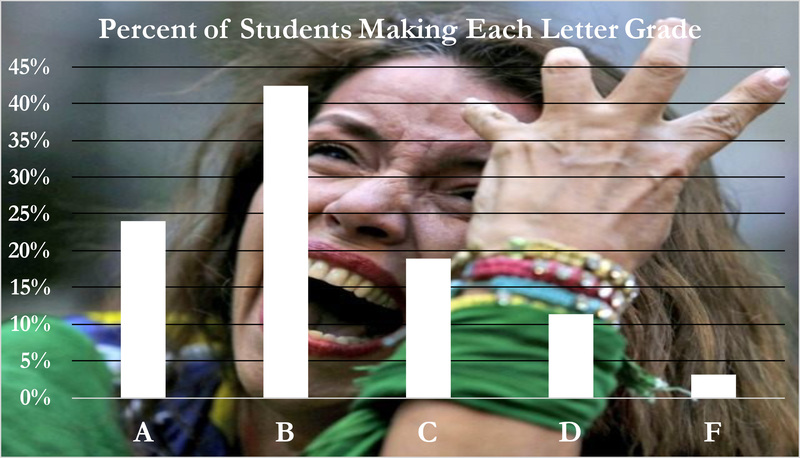 After leading the chant, they should answer the question: How is my average homework grade calculated?. Student Bailey Kerns will begin class on Friday 1/257. After leading the chant, they should answer the question: When is the class paper due? Overview of course and course syllabus. For Homework 1 (due by noon on 1/23) complete the Student Information Sheet online here. Note that it will request your class password, which you can get from the class website at the tab that says Your Password. Homework 2 is a quiz to be taken in the Online Classroom. It is titled Homework 2: Prediction market quiz and is due by midnight on 1/25. A hard copy of the questions is here but you must submit the homework at the Online Classroom. Homework 3 is also administered in Online Classroom, and is titled Homework 3 on Chapter 1 and is due by midnight on 1/27. A hard copy of the questions is here but you must submit the homework at the Online Classroom. Student Ramee Aranda will begin class on Friday. After leading the chant, they should answer the question: What should I do if I miss class? Do I bring an excuse? How will it affect my participation grade? When do we start taking attendance?.